Albert Coates was born at Mt Pleasant. Leaving school at 11 years he worked as a butcher and apprentice bookbinder. During World War One Coates served as a medical orderly at Gallipoli. He was discharged from the Army on 21 February 1919, aged 24, and upon his return to Australia he put himself through medical school by working at night in the postal service. Within a year of graduating, he was appointed acting Professor of Anatomy at the University of Melbourne. Aged 46, he volunteered for duty during World War II and on 17 March 1942 he became a prisoner of war at Padang Sumatra. He left Padang on 7 May as Medical Officer to a party being sent to Burma, and thereby became involved with the infamous Thai-Burma Railway. Hundreds of lives were saved by his surgical work during this time. 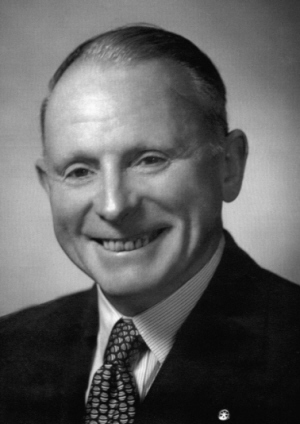 After returning to Australia Albert Coates became Senior Surgeon at the Royal Melbourne Hospital and Stewart Lecturer in Surgery at the University of Melbourne. On 8 September 2006 the former Mt Helen Union Building was named the Albert Coates Complex. Members of the Coates family were present for the naming ceremony. The Albert Coates Trust offers a number of biennial scholarship to Federation University Australia students. The Albert Coates Trust Rural Nursing scholarship was first awarded in 2008. This biography researched by Clare Gervasoni, September 2006, updated February 2009.